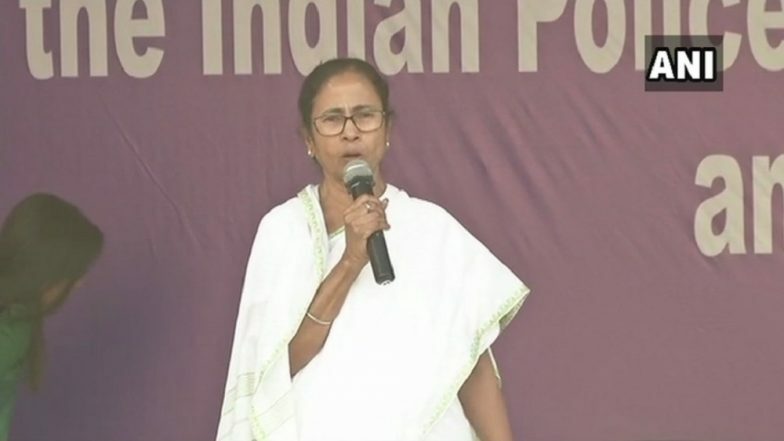 Kolkata, March 19: West Bengal Chief Minister Mamata Banerjee has thrown a Sanskrit mantra chanting challenge at Prime Minister Narendra Modi and Bharatiya Janata Party (BJP) President Amit Shah. In the wake of Lok Sabha Elections 2019, Mamata attacked Modi and Shah over Hindutva politics. She challenged Modi and Shah for a competition of Sanskrit mantras. Lok Sabha Elections 2019: BJP Insulting People of West Bengal, Says CM Mamata Banerjee. "Puja does not only mean sporting a tilak, Amit babu and Modi babu, come have a competition of mantras with me. Let's see who knows more Sanskrit mantras," Mamata said. Mamata Banerjee has been attacked by the BJP in the past for allegedly blocking Durga Puja in the state. West Bengal Lok Sabha Elections 2019 Dates: Constituency-Wise Complete Schedule Of Voting And Results For General Elections. Earlier on March 13, the West Bengal CM also said that the BJP’s demand to declare the state a “super sensitive” zone amounts to insulting the people of the state. “What is the reason behind this? This is humiliation. They are so scared. In Rajasthan, in Tripura, 98 per cent Panchayat seats were uncontested. These are blatant lies," Mamata said. “They talk of political murders. 99 per cent TMC leaders were killed. Is it because we are fighting against Prime Minister Narendra Modi and BJP president Amit Shah,” she asked. She alleged the BJP leaders are trying to curb her party’s voice. Referring to the demand for appointing media observers, she said: “This is astonishing. They have demanded media observers to be deployed. This is a shame," she added. Voting for the Lok Sabha Elections 2019 in West Bengal will be held in seven phases on April 11, 18, 23, 29, May 6, 12 and 19. The counting of votes will take place on May 23.